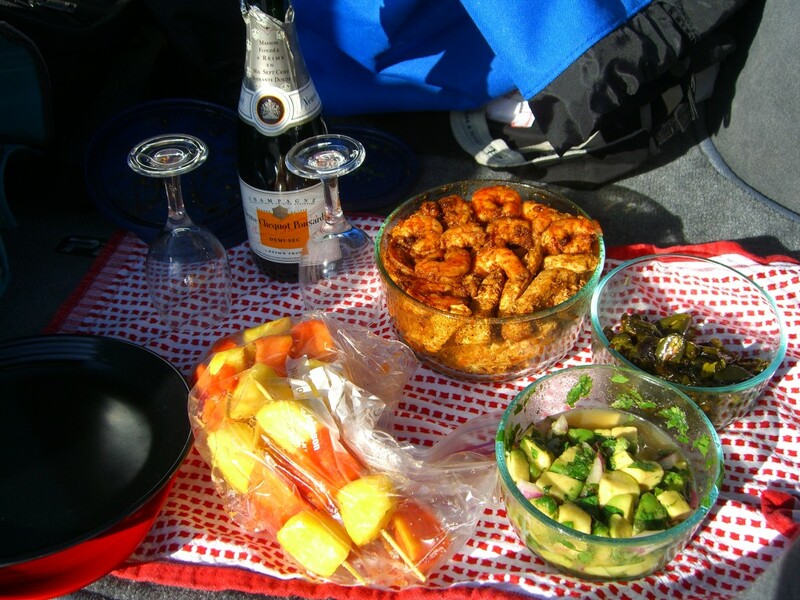 Are you looking for a new fun menu for your next picnic or tailgate party? Then you might want to give this Chili Chicken and Shrimp with Avocado Salsa, Roasted Jalapeno and Pablanos a try. This meal traveled well, tasted delicious, and was easy to pull together. All of the ingredients are gluten free, dairy free, soy free and grain free. I wanted to have something to eat that I could hold in my hand, didn’t have any grains and would taste good cold. So we made this meal into lettuce wraps but you could also use tortillas, gluten free wraps or even just a plate. I also added in tropical fruit kabobs. They were handy. I packed everything into one cooler bag and then a roll on backpack to take on the DC Metro. I met up with Scott, who had just delivered the last session in our Next Level Leadership™ group coaching program in Baltimore. We were headed to the U2 concert at FedEx field. This was his birthday present, delivered a little late. His birthday was in April when the tickets went on sale. First let me say the concert was amazing. If you get a chance to go, take it. If you live in the DC area you know what traffic can be like on the 495 during rush hour and if your lucky enough to have gone to an event at FedEx Field, you also know there is only one road in and out. Major traffic jam. They opened the gates at noon for parking and we got there around 4pm. We had lots of time to tailgate and enjoy our meal. With this being a celebration I brought along a little bottle of Veuve Clicquot champagne. It went great with the meal. We capped off this meal with Elana Amsterdam’s Homemade Starbucks Orange Cake. I made this over the summer for Adopt a Gluten Free Blogger- Elana’s Gluten Free Twinkies. Brad had made the Twinkies and I made the cake. It was an easy cake to make and it tastes great. I like to eat some and freeze some. I was so glad I had this on hand because it went great with this meal. I also snuck a piece into the concert with me so I could have a gluten free snack during the break between bands. I hope when you head out for your next picnic or tailgate party, that you will consider making your food instead of picking up some fast food along the way. This meal can even be made the evening before and still taste great for your event. It actually might taste even better when the spices have more time to marry with the protein. Don’t forget you can always substitute ingredients for what you have on hand or your taste buds. For the protein you can use a sturdy white fish and even scallops would taste great. You can also use pork or beef. If you don’t have time to roast the peppers you can always use fresh sliced jalapenos and Pablanos or you can use the jar of pickled jalapeno peppers. You can also change up the type of salsa you use. Tomato, tomatillo or a jalapeno salsa would also do the trick. If you use a salsa out of the jar, I would recommend taking along some lime wedges and chopped fresh cilantro. It’s the key to brightening up the flavors of the chicken and shrimp. To assemble I took a lettuce leaf, added in either the shrimp or chicken, the avocado salsa and then some peppers. It did get a little messy and I was glad I had added in a couple of plates at the last minute to catch the filling if it fell out. It must have looked as good as it tasted because the couple in the car next to us asked what we were eating. They had stopped for fast food and I think were waiting for us to invite them to dinner. Maybe next time I’ll bring extra just in case. If you give this dish a try, either for a dinner, lunch, picnic, tailgate party or even breakfast, I’d love to hear from you what combination you used. This recipe was submitted to What Can I Eat That’s Gluten Free on the Gluten Free Homemaker blog. Update- These recipes were submitted to Slightly Indulgent Mondays & a giveaway. 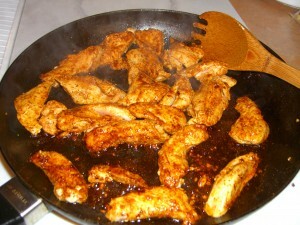 Heat your pan on medium high and add in the oil to warm up. Next add in all of the spices except the salt and pepper. You want to let it heat up until it foams. 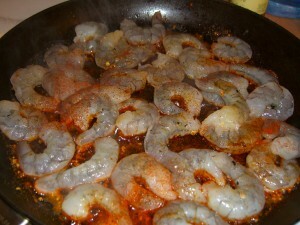 Then you want to add in your protein, either the shrimp or chicken. 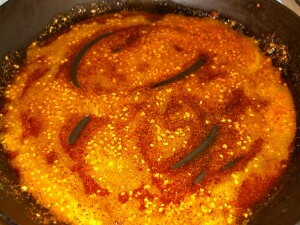 Please make sure it is totally dry before you put it into a pan of hot oil. I cooked the chicken and shrimp separately and heated the spices for each batch. You don’t need to have two different types of protein, one will work great. I just wanted a little variety and I knew I was going to be very hungry. Take the protein out of the pan and place on a plate to cool. Then you can put it in your to go container. I find glass works the best for me. Run your knife all the way around your avocado making one continuous circle to cut it in half. Twist and pull apart. To take out the pit carefully take your chef knife and cleave the pit. If you are not use to doing this, DO NOT hold the avocado in your hand while you do this, place it securely on your cutting board. I like to use the groove where the handle is on my cutting board. Once the knife is lodged into the pit, hold the avocado with your non dominant hand and the knife in your dominant hand. Give the knife a little twist and the pit should release. I dice my avocado right in the skin and then scoop it out with a spoon. Make cuts like a tic tac toe board, only more lines. You can also scoop it out and dice it on the cutting board. I find it slippery and it moves around a lot. Slippery and knives are not a good combination. 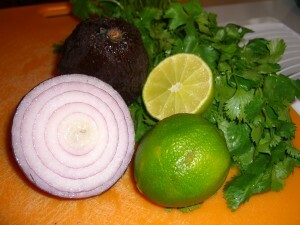 I like to rough chop the onion and cilantro for this recipe to give it more texture. Add those ingredients into your bowl or for a picnic right into your to go container. Squeeze in the lime juice and add salt and pepper to taste. That means you add it, mix it up and taste it. If it needs more, add it. Keep in mind you can add more but not take any away so go slow until you get the taste you want. Pre-heat your oven to 425 degrees. Cut your peppers in half and toss in olive oil. Place on cookie sheet and cook until blistering. This takes anywhere from 30 to 45 minutes. You can always turn the oven up to 450 and it will go a little faster. I turned it down so I would have time to get a few other things done at the same time. When the peppers are done, take them out and let them cool enough to be handled. Take the stems and skin off. You decide how much of the seeds you want to take out. The more seeds you leave on, the hotter the heat of the pepper will be. You can decide to leave just a couple with seeds and get rid of the rest. Once that is done, chop the peppers and put into your container. I added in the fruit kabobs so we could have a refreshing treat with our meal. We ate so much of the wraps that we were full and only ate a few of these fruit kabobs. Guess what today’s breakfast was. I always imagine you cooking along side Bobby Flay when I see your recipes. 🙂 Looks delish! I am a huge fan of roasted peppers – they go well with so many things. I used roasted peppers in my relish for my burger contest and it was a big hit. Amy- You so just made my day! Me and Bobby Flay on a throw down. I think if he walked into my kitchen I'd pass out. My family and friends kept begging me to try out for Next Food Network Star. I chickened out. Had the application completed but didn't do the video. Oh well. I thought it would be great to get the word out on cooking gluten free and dairy free can be fun and easy and taste great. Maybe next year. Looks delicious! I like the first pic, very nice 🙂 I've got SOOO many jalapeno peppers in my garden, many of them are even turning red. Ack, what to do with them all. I'm on a canning kick, maybe most will get used that way but I'm going to try roasting some too. mmm! Wow, Diane — that was a lot of good information! 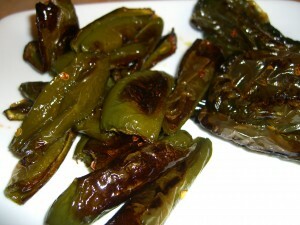 I've been roasting and freezing chiles like crazy the past few days. I've received a bunch from my CSA and my two little jalapeno plants are going nuts right now. I love pulling out a batch of roasted chiles mid-winter and whipping up a pot of New Mexico green chile stew (I used to live in Taos, so this was a staple). Love the fruit kabobs! No end to the creative design of those things! Melissa- I'm going to have to freeze some too. You're right, it's great to have on hand. I'm going to have to try your New Mexican green chili stew. I do love chilies! Yum! Sounds wonderful, I love spicy! Alta- This really wasn't that spicy for me. Ancho chili powder is more of a smokey flavor and the cayenne is the hot. Next time I'll add more of that or leave more seeds on the jalapenos. What a wonderful feast and awesome birthday experience (never too late IMO)! You did it right for sure! 🙂 Oh, and I'd like to make a milder version for us in the future … yum. 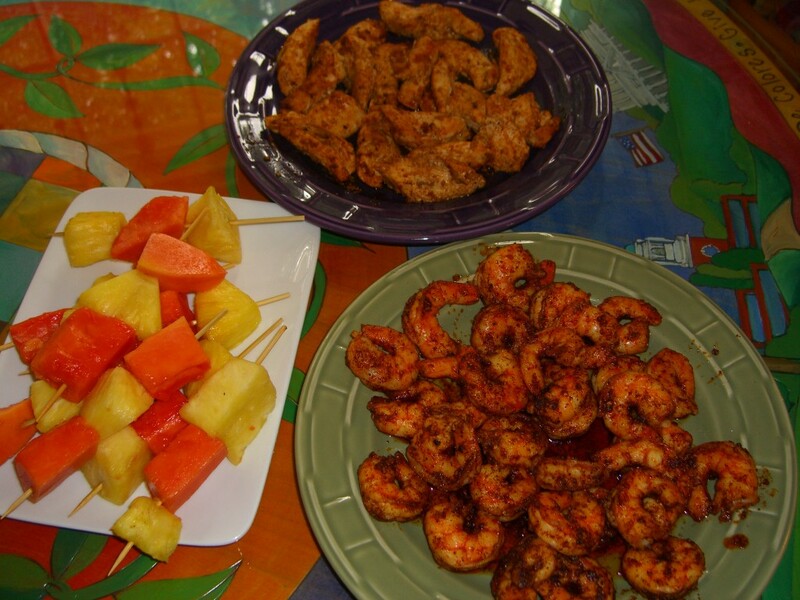 Shirley- The shrimp were not spicy since ancho chili is more smokey. To keep those jalapeno peppers under control take out the seeds and you'll be fine. Boy that's a mouthful (your title)! It sounds like you had a great time, and the food looks wonderful. Thanks for sharing it as part of "What can I eat?" Linda- I know, crazy long title but I didn't want to miss any of the important parts. Sounds silly but it tasted good. Happy to share. Oh yeah, you're definitely in my neighborhood of flavors. Great ingredients and spices, I love the side of fresh fruit to temper the Mexican spices. Looks delicious! Brian- Too bad you don't live close by. I bet our families could have dinner parties and be right in step. I love your recipes too. Amy- I love Slightly Indulgent Mondays!! !